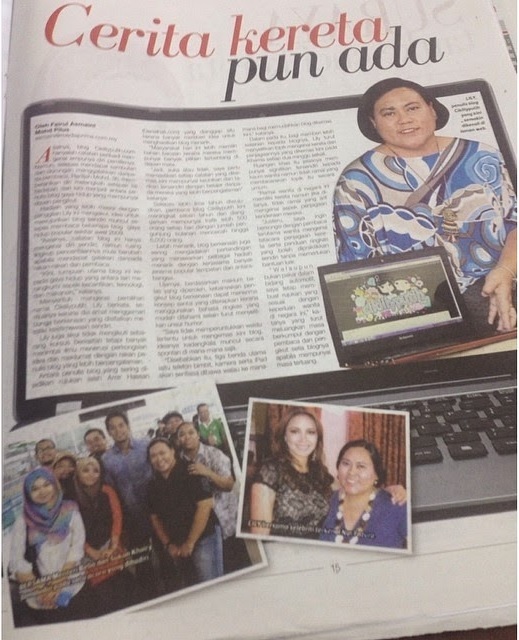 Mesti ramai tak pernah dengar jenama penjagaan muka SCIENCE ON SKIN (SOS) kan ? Memang ye pun, jenama ni baru berada di pasaran. SCIENCE ON SKIN (SOS) - sebuah jenama baru rawatan penjagaan kulit yang menggabungkan penjagaan kulit sains inovatif dengan seni halus kecantikan ke pelbagai produk rawatan untuk kulit terbaik. 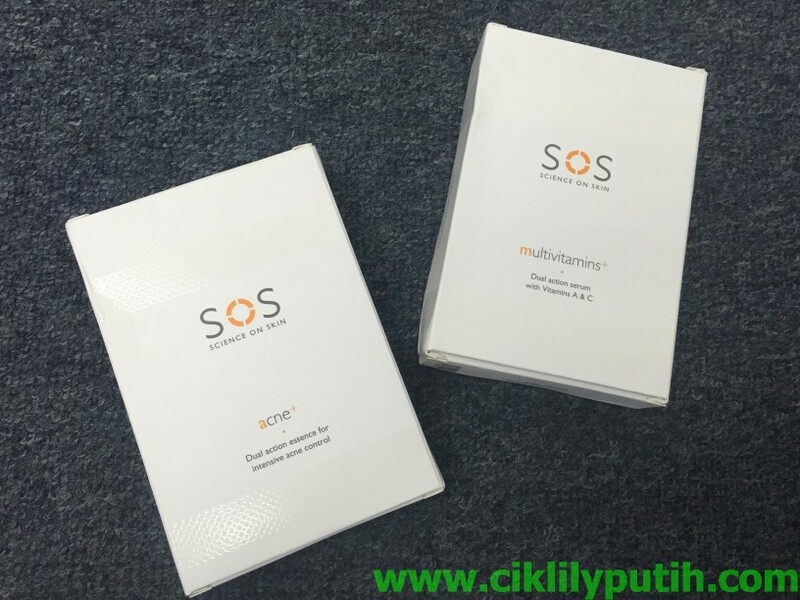 Mengandungi Cleanse+, Acne+ and Multivitamins+, produk SCIENCE ON SKIN (SOS) mempunyai keunikan berbeza daripada produk-produk Kecantikan yang lain di luar sana, seperti mereka dengan megahnya formulasi dermatologi dibangunkan dengan menawarkan tumpuan yang lebih tinggi daripada bahan-bahan aktif untuk merawat, memberi nafas baru dan melindungi kulit dari radikal bebas. Di reka secara teliti untuk memberikan sinergi dan pelbagai manfaat kulit-meningkatkan itulah penyelesaian semua dalam ane seseorang akan merasa perlu untuk kulit yang jelas dan bersinar. 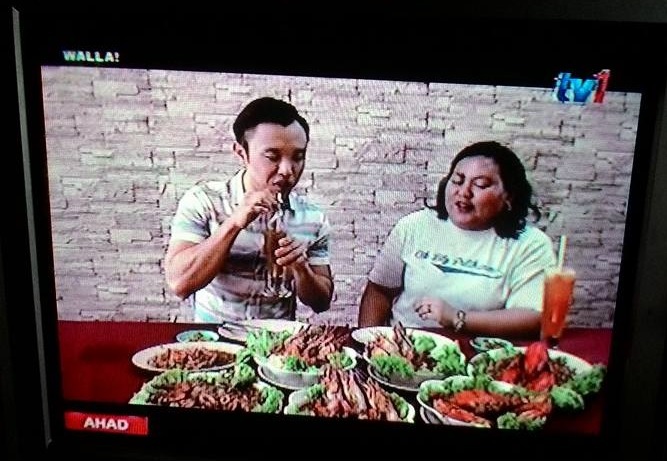 Ok untuk kandungan bahan-bahan setiap produk ini, aku kongsikan didalam English language ek. Cleanse+ also balances the skin's pH level, enhances the skin's ability to retain moisture for firmer and tighter skin, and prepares it for better absorption of treatment products. 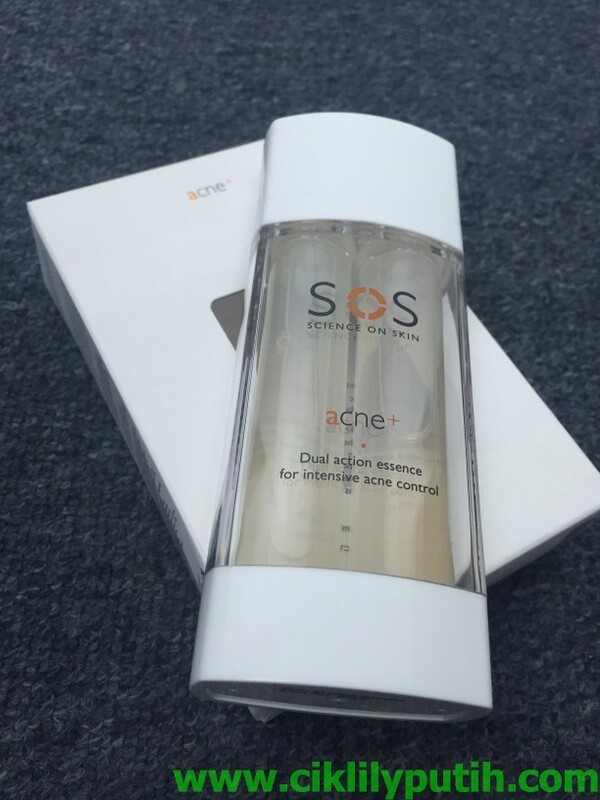 More than just an essence to treat and control comedones and acnes, SOS Acne+ is formulated with a powerful yet soothing suite of active ingredients to calm, improve and brighten the skin simultaneously. Packaged in a dual-chamber pump dispenser, Acne+ delivers a pore-clearing gel and a sebum control gel in one easy bottle. The essence's proprietary and synergistic blend of active ingredients fights against all types of acne, be it the common adolescent form caused by hormonal changes or the adult acne, usually triggered by lifestyle or environmental factors. One of the key ingredients is Zinc PCA, which has been shown to be highly effective in the control of excess oil and the treatment of acne, while moisturising the skin at the same time. Working in tandem to boost the effectiveness is the active ingredient of Iris Extract, which has strong anti-acne, anti-inflammatory, anti-bacterial and astringent properties that soothe as it regulates sebum production. The addition of anti-inflammatory Licorice further calms and prevents redness. A natural skin lightener, it also helps to diminish the dark pigmentation resulting from scars and evens out skin tone. Enhancing the skin is a trio of vitamins- Vitamin 83, Vitamin C and Provitamin 85. The potent anti-oxidant trio prevents moisture loss and helps to maintain the skin's natural balance while providing anti-aging support. With regular application of Acne+, future breakouts are prevented with the skin calmed, purified and infected pores quickly cleared. An even complexion is achieved with lightened acne scars, and the skin is soft with a matte finish, and diminished shine and pore visibility. 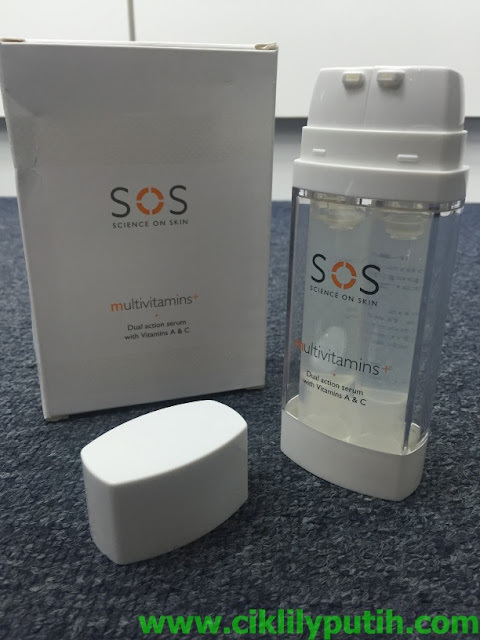 To transform a clear complexion to a firm, luminous and glowing one, SOS Multivitamins+ is formulated with a high concentration of Vitamins A, C and E, and a proprietary blend of stem cells,botanical extracts, collagen and potent peptides. When applied on the skin, Vitamin A helps to thicken and stimulate the dermis, so it reduces wrinkles and increases blood flow to the surface of the skin. In addition, Vitamin A increases the deposition of collagen, therefore it slows the normal aging breakdown of collagen and elastin. Vitamins C and E are powerful additions to an anti-aging skin-care regimen. The antioxidants neutralise free radicals that age the skin, which helps to keep skin firm and youthful, and reverse and prevent signs of aging. The anti-oxidant activities are intensely boosted by the addition of proprietary Stem Cells, which dramatically improve elasticity and firmness for a younger appearance. For an even complexion, Arbutin is added to inhibit tyrosinase, an enzyme that catalyses the production of pigments and thus inhibits the formation of melanin. It promotes reduction of irregular pigmentation or melanin patches and improves skin blemishes. Sodium Hyaluronate and Provitamin 85 hydrate and retain moisture to keep skin soft and silky. When combined with anti-aging collagen, peptides and other botanical extracts, the supercharged Multivitamins+ delivers a powerful bundle of benefits, including the brightening of complexion, and reduction of fine lines and wrinkles. Additionally, Multivitamins+ supports collagen and elastin production, suppresses melanin production and lightens pigment spot. With regular use, the skin feels firm and bouncy, with a healthy radiance and irresistible glow. Kedua-dua produk serum ini di datangkan di dalam botol unik yang mempunyai 2 pump untuk mengekalkan kebersihan dan kualiti produk tersebut. Disyorkan untuk kegunaan malam, untuk membaikpulih semulajadi kulit dan meningkatkan pengekalan lembapan kulit. 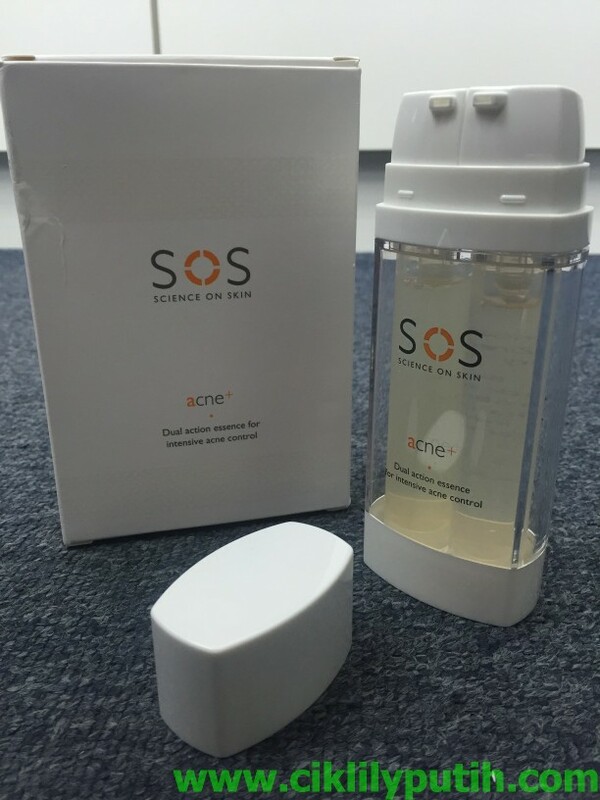 Established in April2016, SCIENCE ON SKIN (SOS) is a brand new treatment skincare brand that intelligently marries the innovative science of skincare with the delicate art of beauty into a streamlined range of treatment products for the best skin one will ever have. dekat mana ya mudah nk cari skincare ni?boleh saya tahu x?